of course they are! just think about the homesickness, loneliness, and cultural struggles that OFWs have to endure. what makes matters worse is if they have cruel bosses or hostile co-workers. but hey, let's not forget that the spouses of these OFWs are heroes too! sadly, another burden they experience is when they get falsely accused of financial mismanagement ("saan ba napupunta ang perang pinapadala ko sa iyo?) or having illicit affairs. 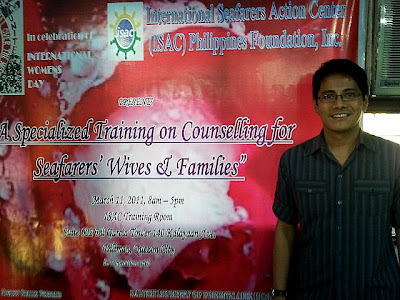 although seafarers aren't exactly OFWs, they also spend long periods of time away from their families. hence, their spouses suffer the same fate as the spouses of OFWs. but whether spouse of OFW, seafarer, or anyone else, it's always satisfying for me to assist them in their emotional burdens. 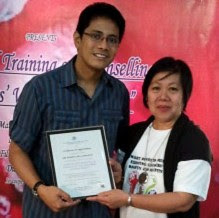 this time, my chance to help them comes in the form of teaching them how to be good peer counselors for each other. i hope that they become a good support for each other in their times of difficulties and crises. with ms. rita lim seno-ogbinar, head of the women & children's desk of the international seafarers action center philippines. i like this because i could relate im a wife of a seafarer.